Next week steel will begin to flow into the site, accompanied by cranes and an additional fork lift. Here are pictures taken from roof-level March 27th. You can see many details from the top of the building 26′ 5 1/2″ in the air not visible from ground level. 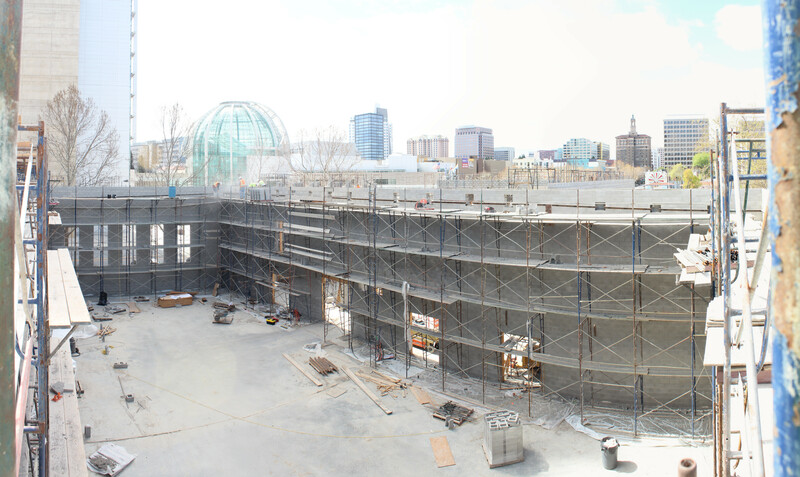 This first picture is a view of the sanctuary and atrium areas taken from the back sanctuary wall which divides the east and west sections of the building. 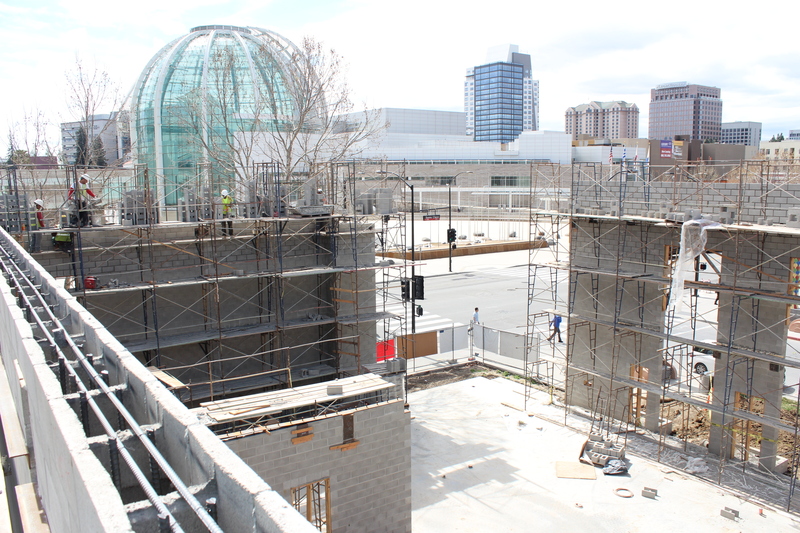 This picture is taken from the North east corner of the building looking over the atrium. 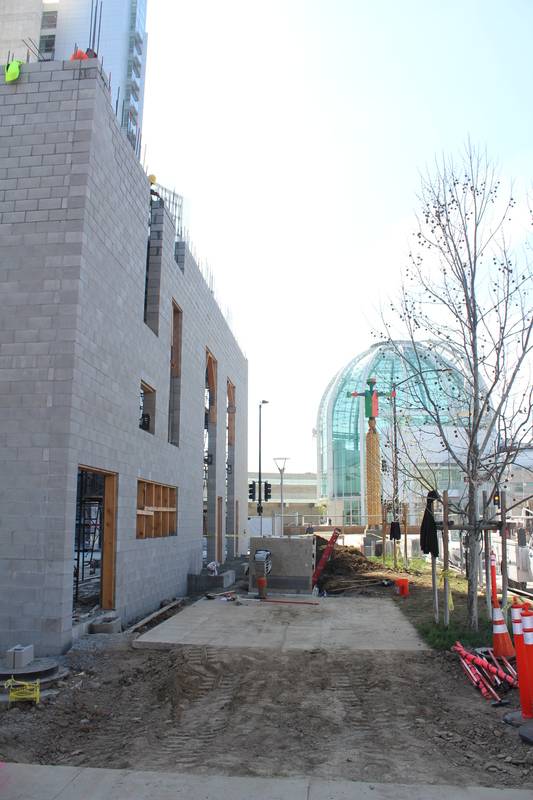 Here are two views of the sanctuary wall on Santa Clara street. The first looking at the south east corner, the next at the south west corner. 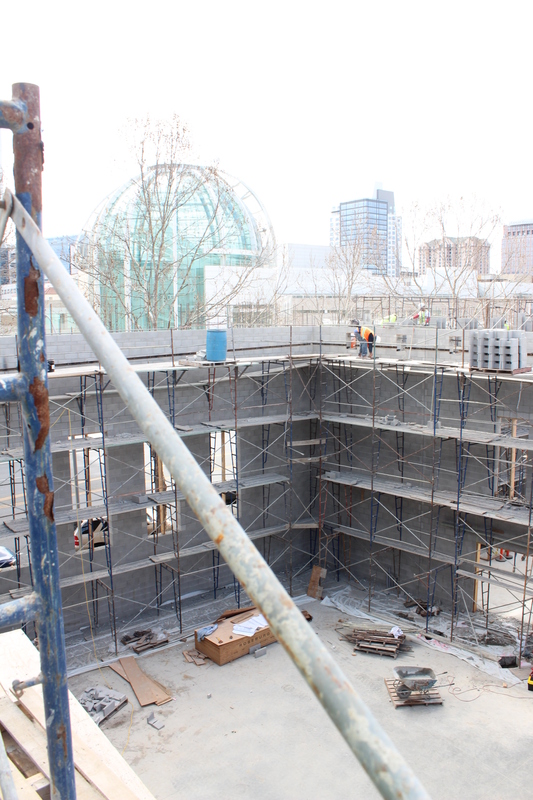 This is a view of the north west corner taken from above the focal point. 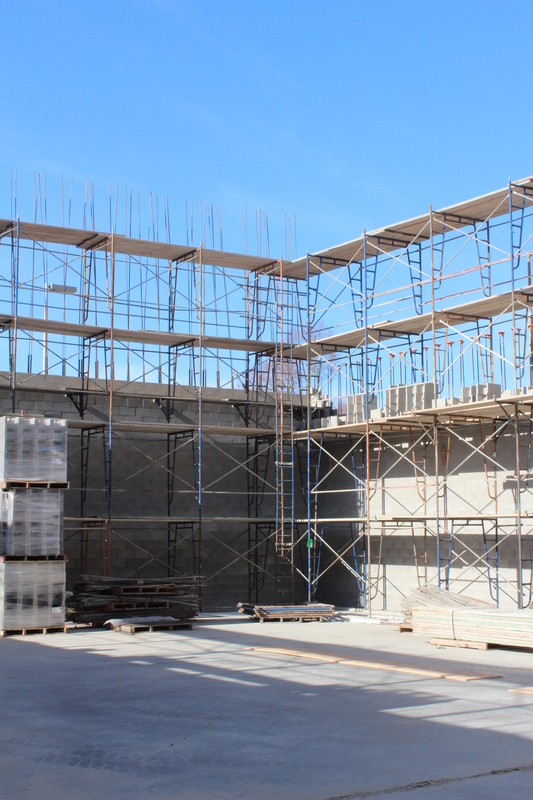 You can see the cut-outs that will house the soon-to-be-installed truss system in these views of the south and west walls of the sanctuary and close-up of the back (west) wall of the sanctuary. 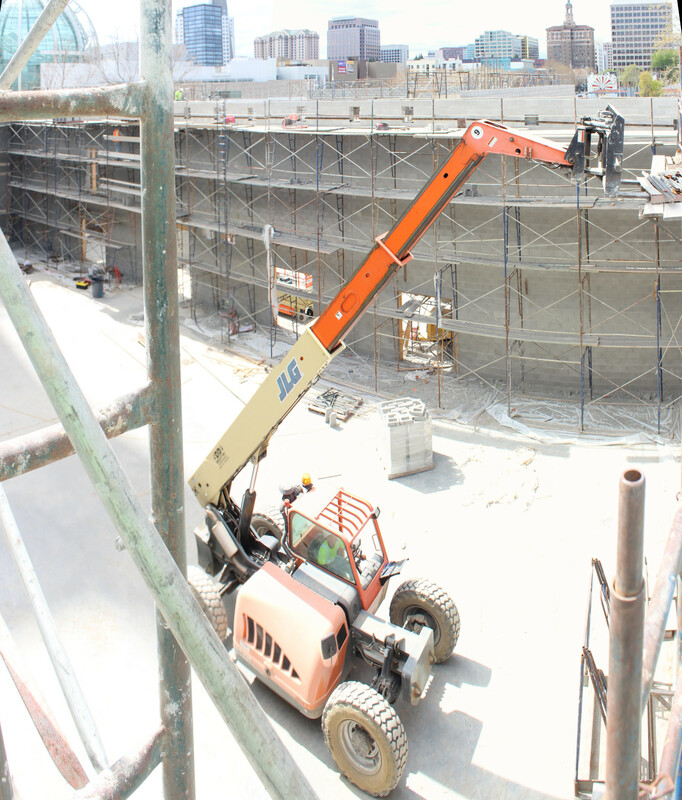 This birdseye panorama of the east wall is distorted however shows the attachment ports for the truss system. Notice the reinforced supports for the pipe organ chamber in the lower right of the east wall. 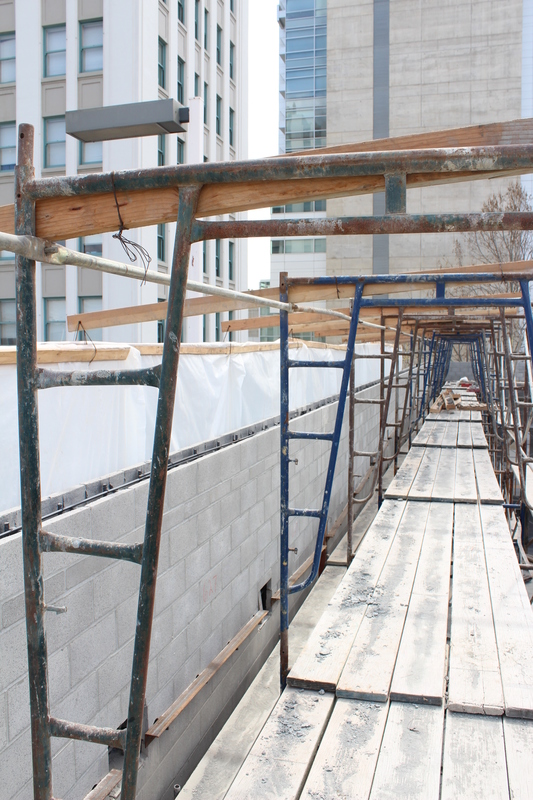 The scaffolding used for CMU construction will be removed starting March 28th. These pictures show the high lifter as it is removing excess materials from the scaffolding on the north wall of the youth room. 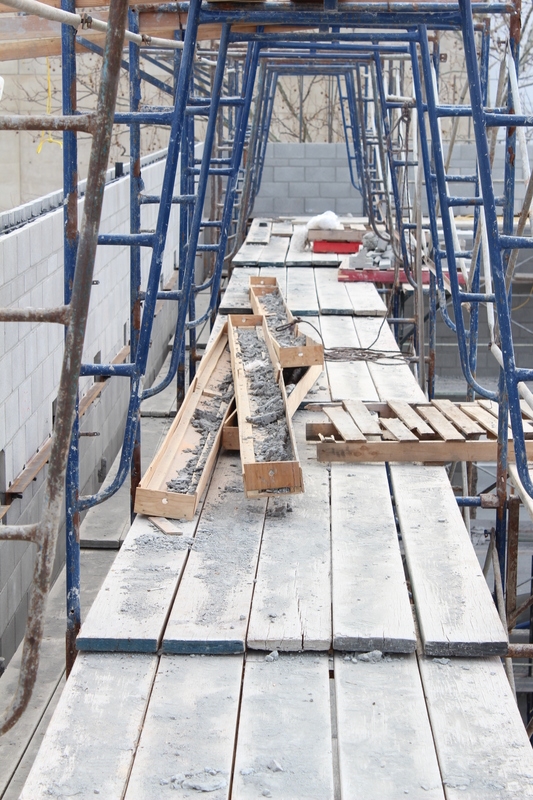 Construction sites are not always clean, neat or quiet. South Bay Construction and their contractors take safety and neatness seriously, however, as is evident by many small signs around the site. 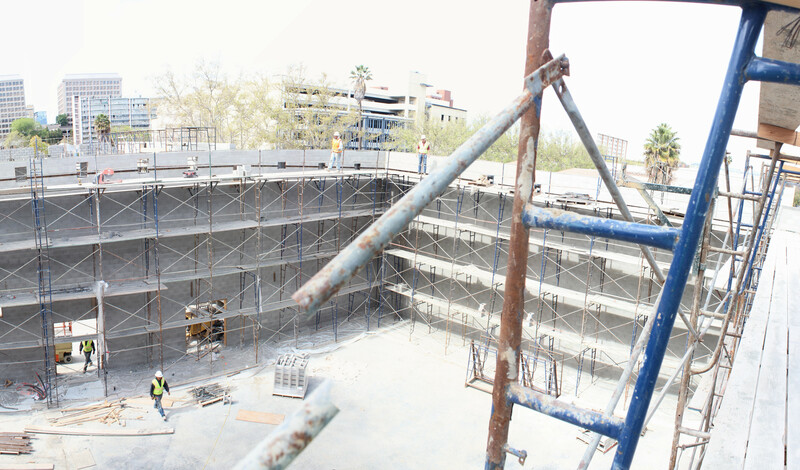 During the muddy season over last month construction proceeded pretty much on schedule. Delivery trucks, especially the cement trucks, entered the site daily and frequently. Before leaving the site they were power washed to remove as much mud and dust as possible. While there are signs of heavy traffic in the street, there are no large mud tracks or dirt piles. 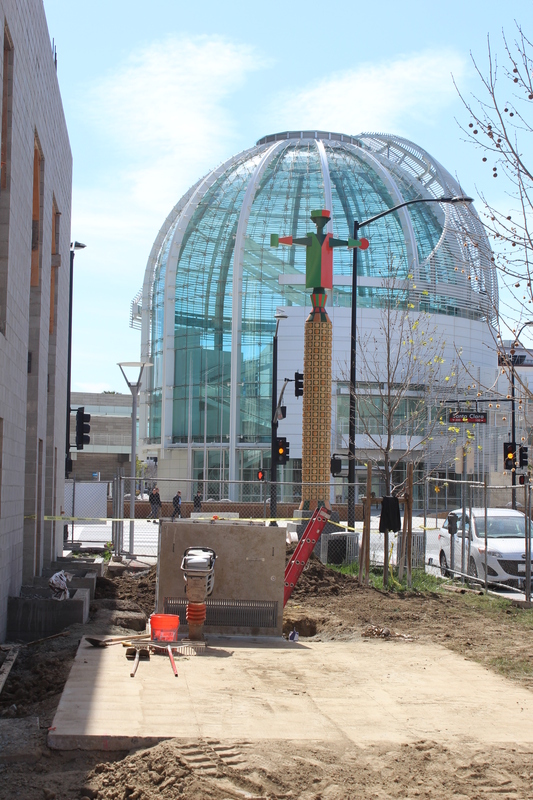 That’s due to the conscientiousness of the SBC supervisor Larry Smedly and the many subcontractors. 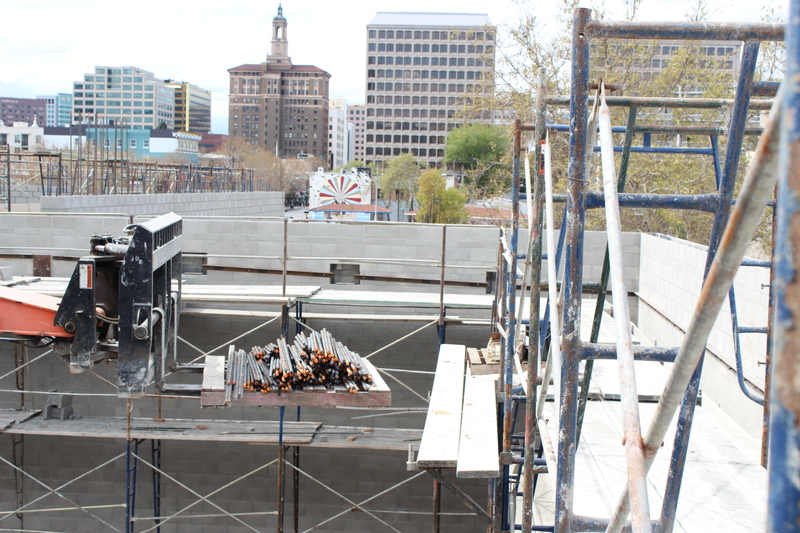 These pictures show the trap-trays used to catch loose mortar that may have strayed onto the roof of the noodle house during construction of the east wall and the plastic “drapes” used to protect the adjacent Vintage Tower parking lot. 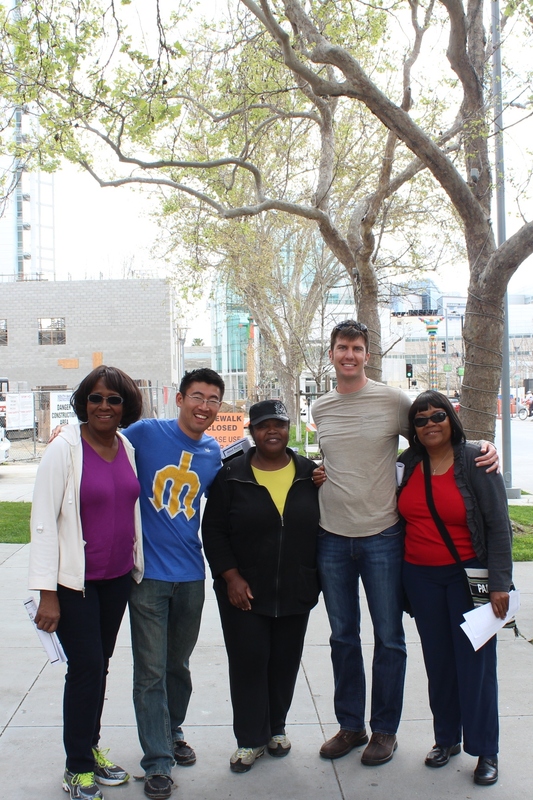 Today, Pastors Jonathan and Shinya prayer-walked the neighborhood with friends from neighboring Antioch Baptist Church. Our pastors are pictured here with Sisters Sarah, Helen and Annie (from left to right). As they walked, they prayed for the families, residents and businesses of our local community. Highlights of the day include stopping at our 6th Street Parking Lot to pray with Pastor Oakie and John of the Believers in Christ Ministry that feeds over 150 people in need each Sunday afternoon. The group spent time at the new building site, praying over the workers and the ministries that will be housed in the building. The visitors loved hearing the history of our faithful congregation and our rebuilding has inspired them. Antioch Baptist Church, organized in 1893, is the oldest African American Church in San Jose. Most of the effort over last few weeks was focused on completion of the walls. Other projects continue. The transformer vault is nearing completion. Foundation for the playground storage area, trash containers, and bike racks was placed. Here are additional pictures from inside and outside of the Church. 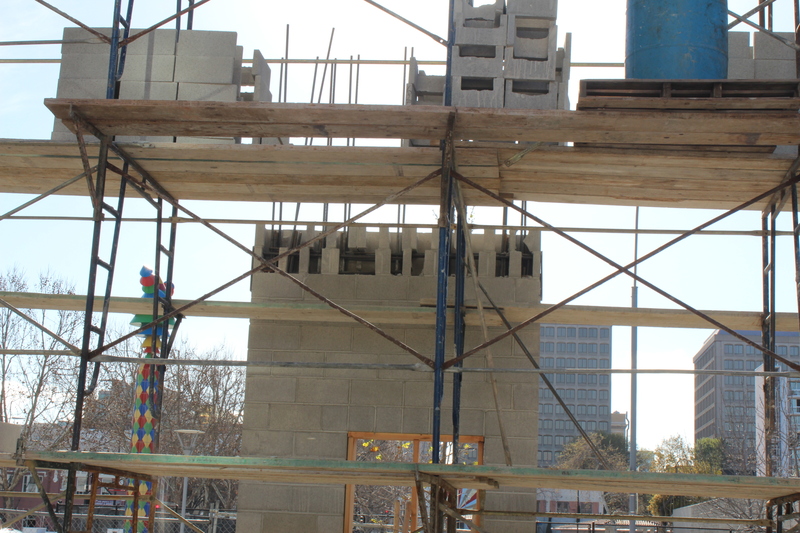 The CMU (Concrete Masonry Unit) construction phase of the Church is nearly complete. There are a few small tasks to be completed and clean-up will run into next week. 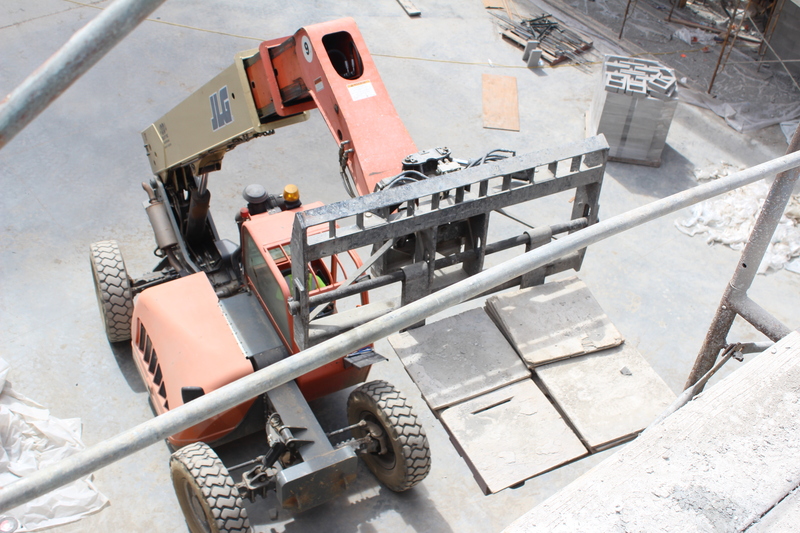 Today the hi-lifter was removing unused materials from the scaffolding. 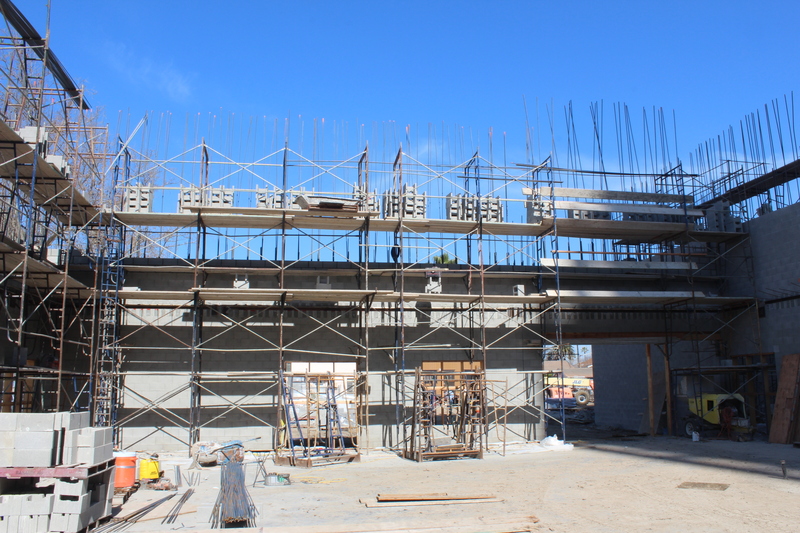 Next week steel components that will form the basis of the second floor and roof will begin to appear on the site. 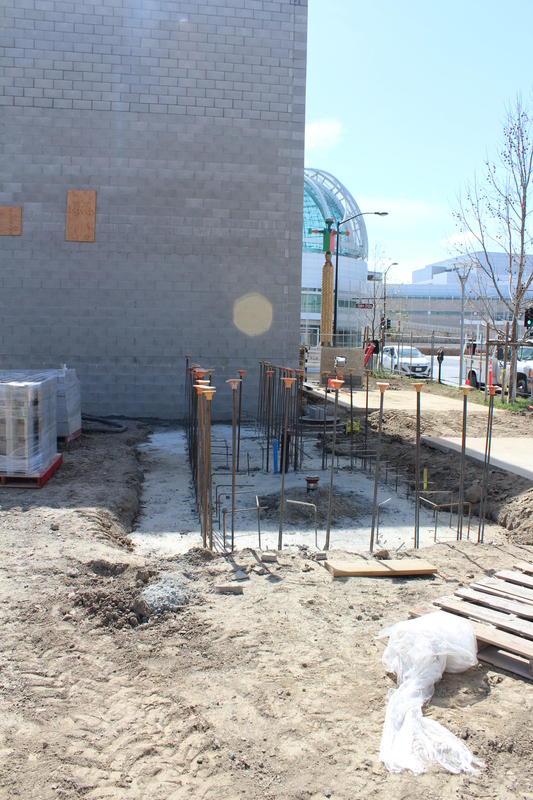 By mid-next week the Open Web Steel Joist (OWSJ) construction will begin. The pictures below provide many views of the walls. Last week I had the opportunity to connect with Chas Pratt, our supervisor from Diablo Valley Masonry , the team responsible for the excellent masonry work now under way. He provided some background information I think others might enjoy. 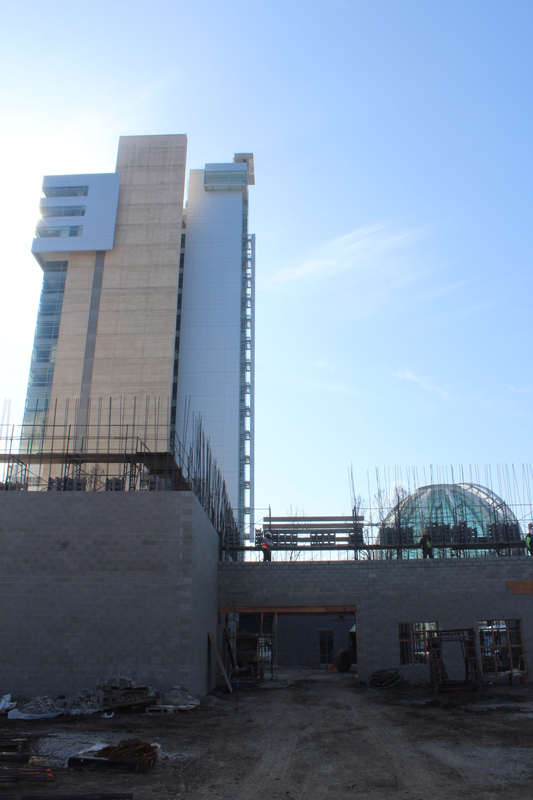 As you can see from the picture below, wall construction has now proceeded to the second floor. 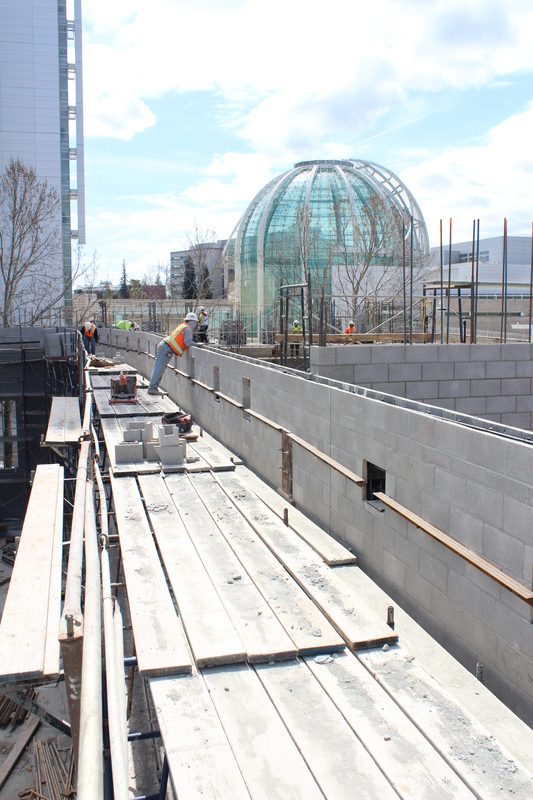 Eventually the walls will be as high as the rebar extending out from the unfinished wall (also see below). 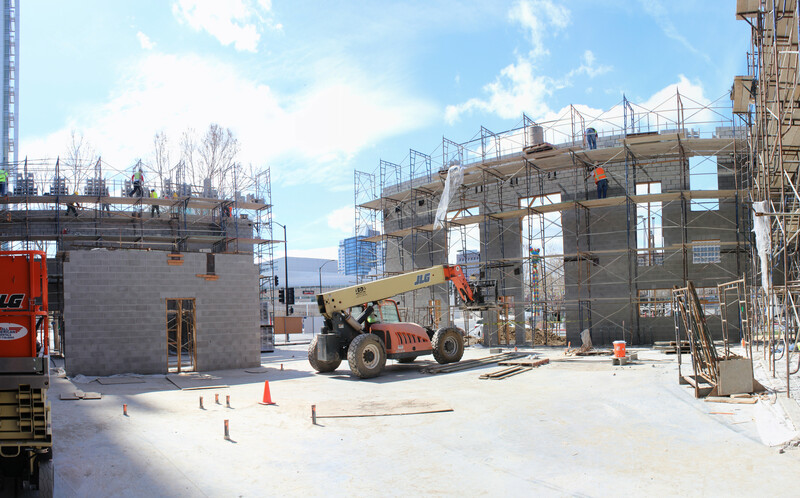 The use of a CMU construction technique developed by SEI in conjunction with our architect Vitae, coupled with simplified steel infrastrucure , enabled our builder South Bay Construction to provide a larger more functional building than the previous approach. 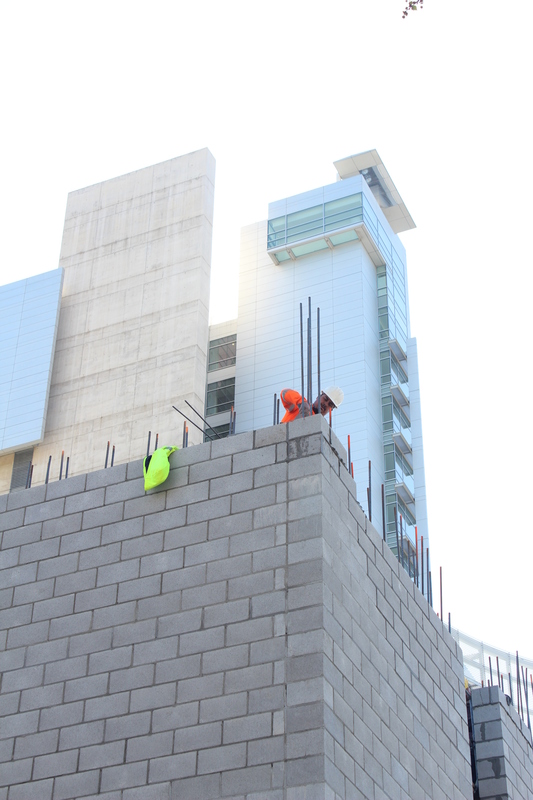 More details in a previous blog: CMU Wall Construction Begins. 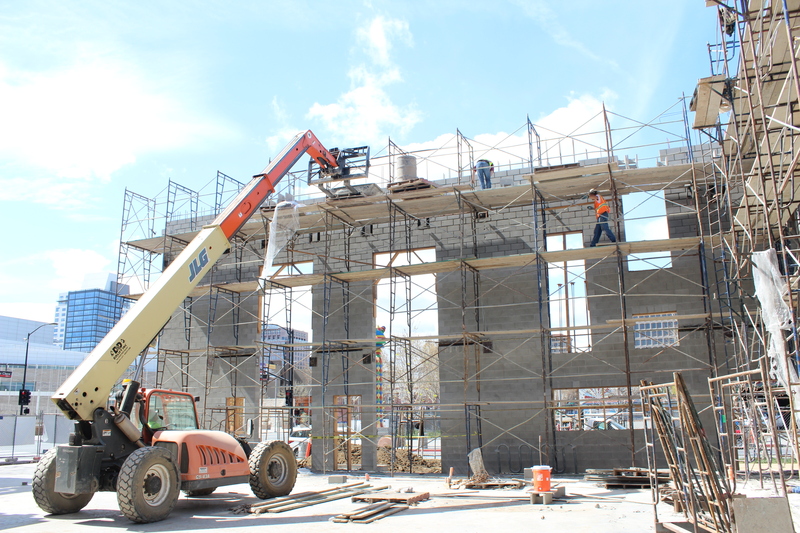 The second floor will be attached to large steel plates embedded in the CMU frame. Strengh for these attachment points is increased by removing some of the concrete block structure and replacing it with concrete grout. 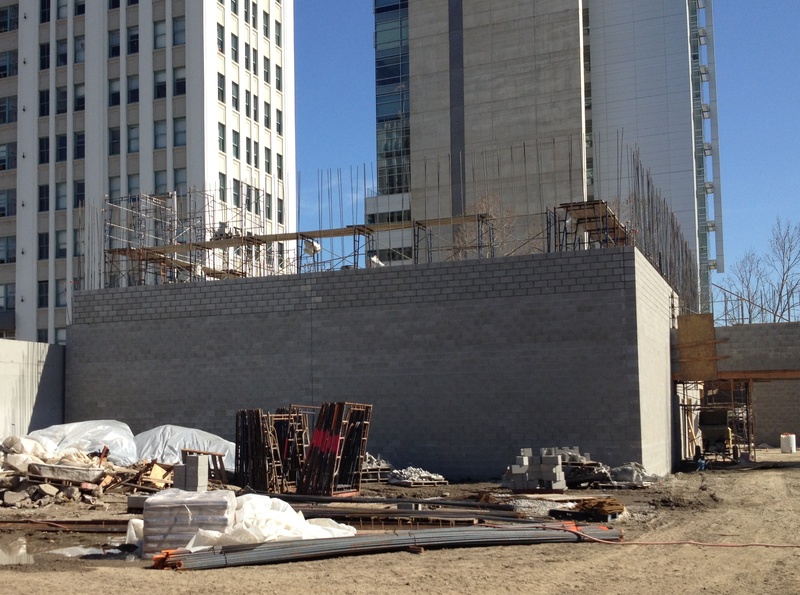 You can see portions of the CMU structure on the Fifth Street wall removed here in anticipation of such strenghening. 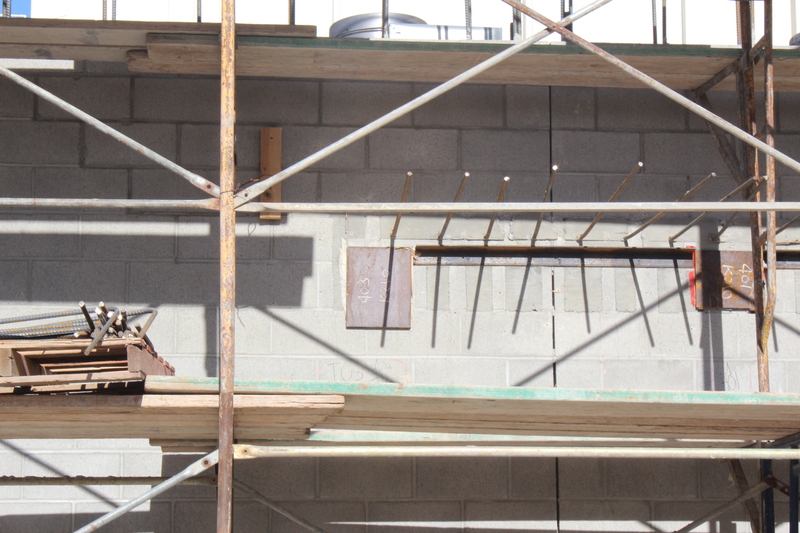 Also notice the steel plates in the wall on the East side of the building. This would be the wall adjacent to the Noodle House. 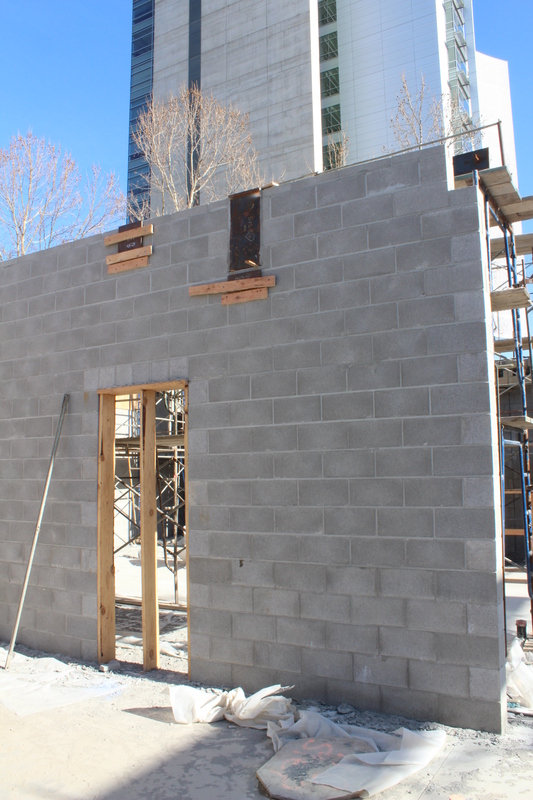 Steel plates are also evident in the south kitchen wall (notice the door to the pantry) and sanctuary rear walls. 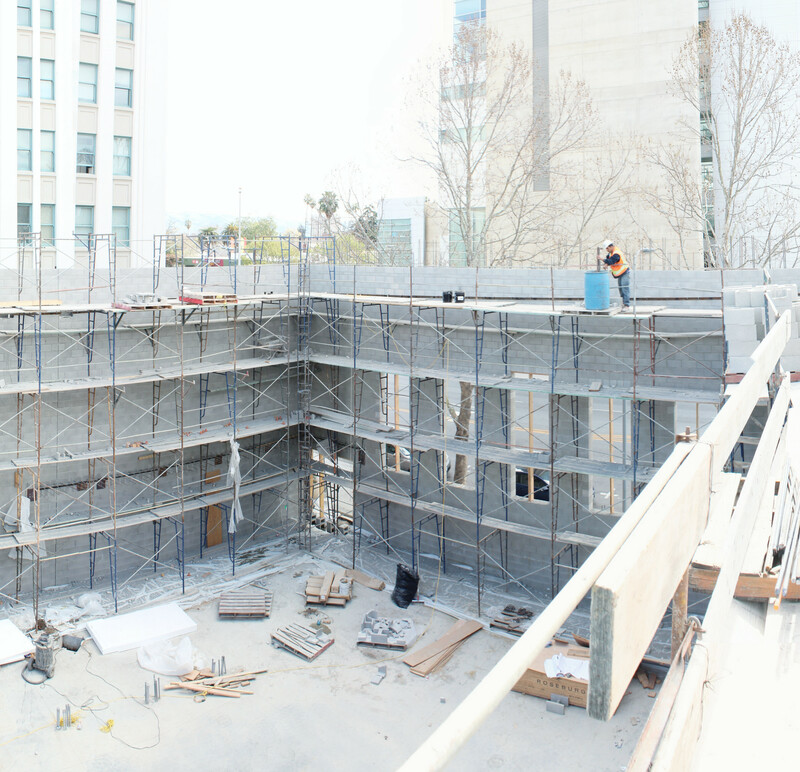 Here are two more pictures showing the heighth of the second floor. 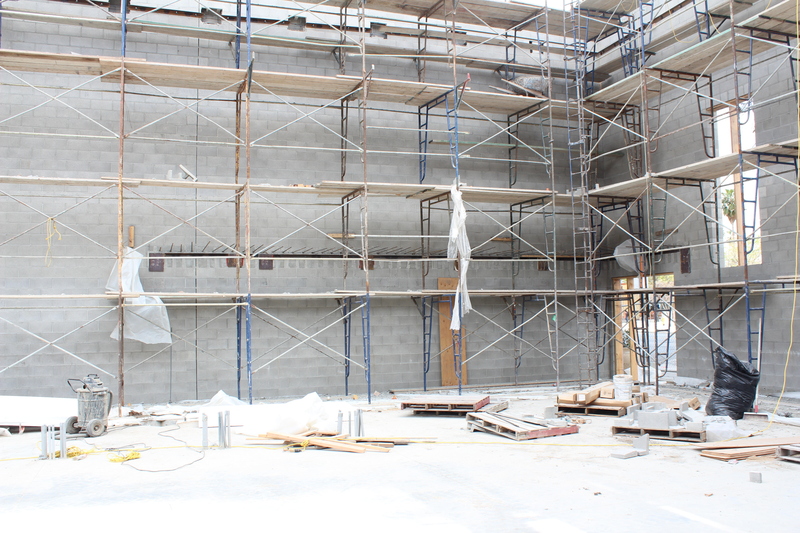 The first is the pre-school wall looking north and the youth room as viewed from the sanctuary. 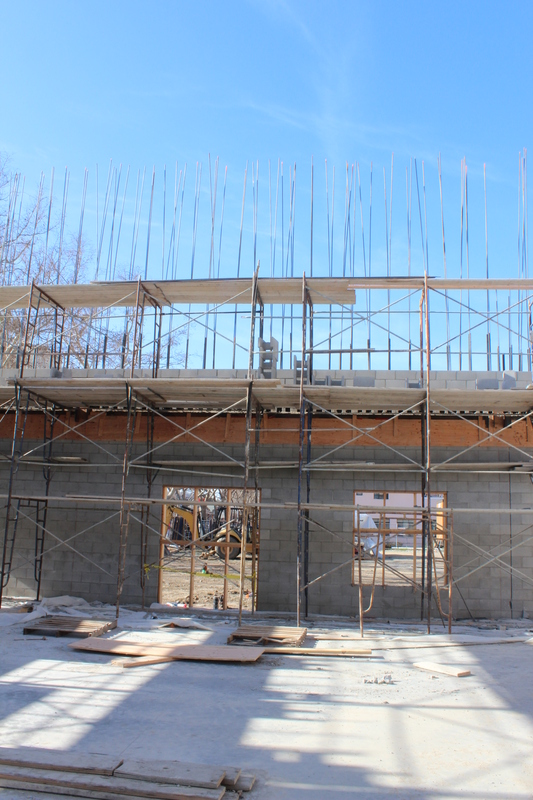 This last picture is a “fish eye view” of the pre-school entrance, utility room and Community Service room as viewed from North Fifth Street. Here are additional pictures taken a day later. 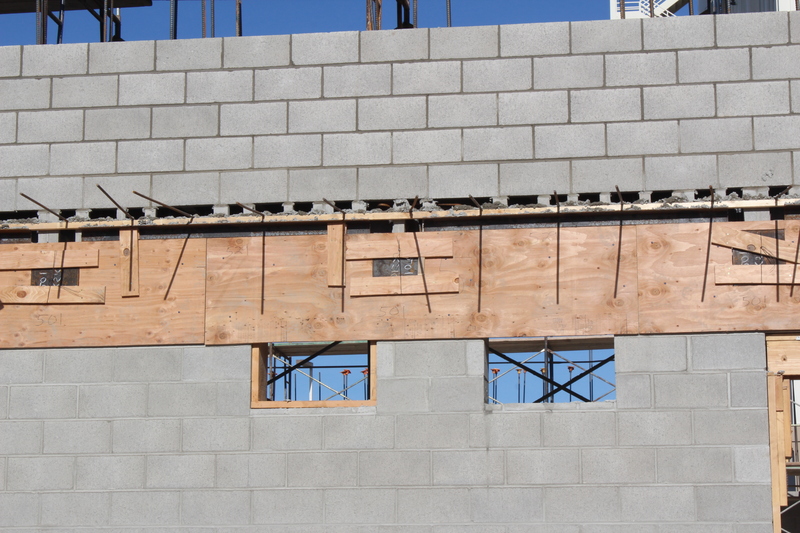 The wooden framing has been removed from the rear sanctuary wall and the second floor plates are now visible. 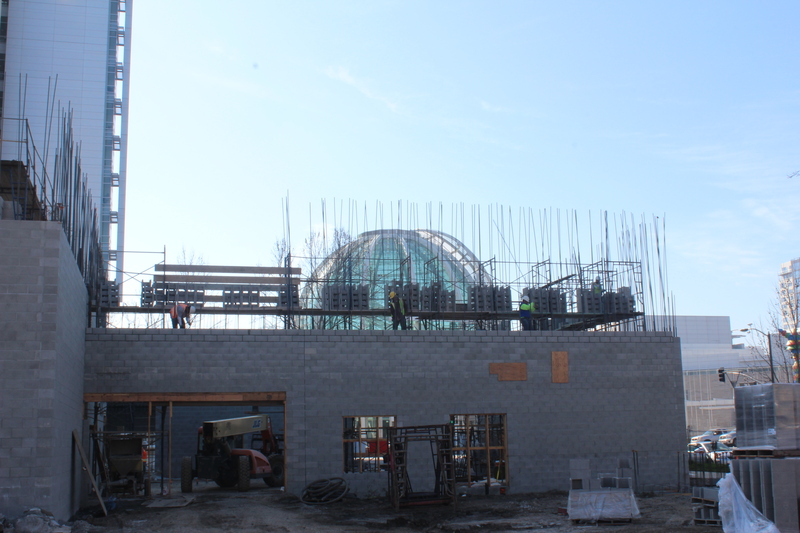 The pre-school wall continues to rise, and the rotunda frames this wall as viewed from the north in the next picture. 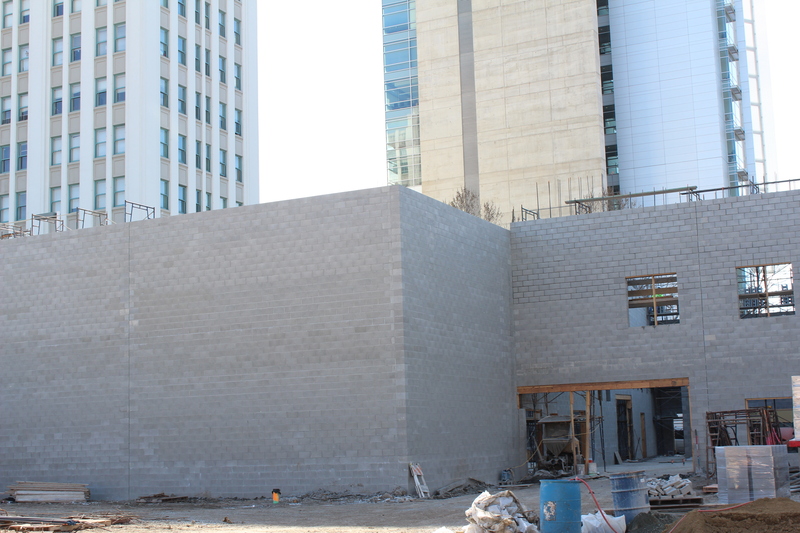 Another view of pre-school wall with city hall in the background. Thanks to the team at Vitae Architects, you may now take a virtual tour of our new building. 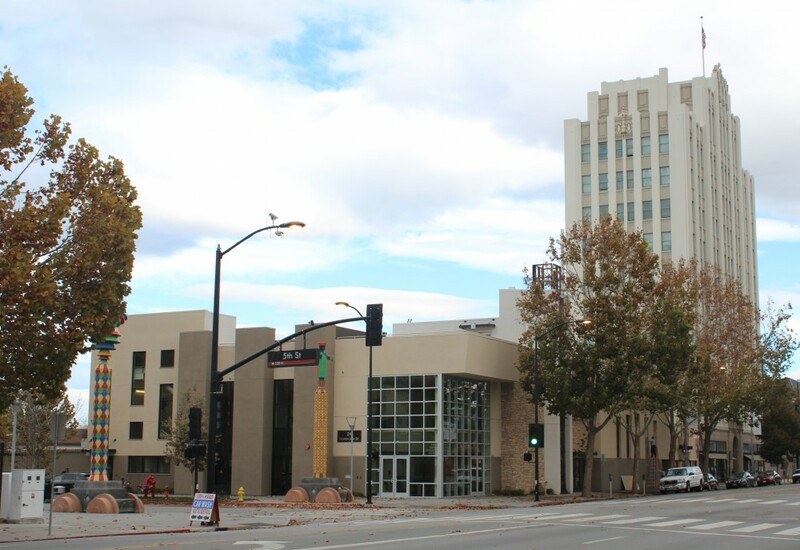 Starting at the city parking lot on North 5th, walk east toward the City Hall Rotunda. Turn left at Santa Clara and cross over N 5th to enter the atrium. Head toward the Sanctuary, and take the elevator to the third floor deck area. While on the deck view downtown San Jose, the Rotunda and City Hall. Return to the first floor and enter the Sanctuary. On the south wall notice five art glass windows. Directly ahead you will see the “front” of the sanctuary with pulpit and flat panel displays (they will not be as big as shown). Turn left, exiting the Sanctuary then turn right toward the pre-school area. Directly ahead is a large stained glass window (shown here as art glass; will be from the original Church). If you look closely you can see through the window into the play area. Turn left and west toward N 5th street. You will see two pre-school rooms on the right and the children’s play area on the right. Once you exit the building take a deep breath and relax as evening falls and the exterior lights turn on.